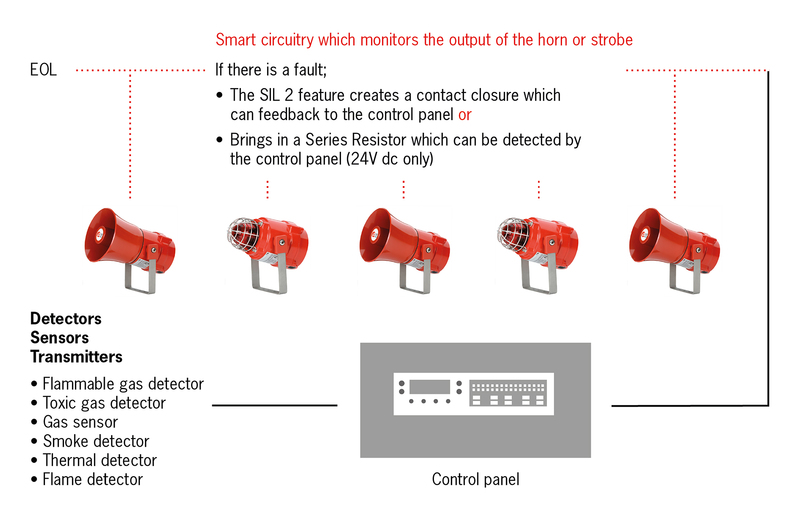 A smart combination of software and hardware removes the need for time-consuming inspection and test of each individual warning device by intelligently reading the sound output of the horn or the light emitted by the strobe to check it is working properly. State-of-the-art technology ensures that spurious signals are not picked up by the sensors to ensure a reliable monitoring at all times. To comply with SIL 2 requirements, this is only done during an automatic test of the system and any faults are reported back when the system returns to its normal monitoring state. Communication with the system control panel can be configured in two ways: either a contact is closed or a series resistor is brought into the monitoring circuit in the event of a fault. A dedicated SIL 2 information page can be found at http://www.e2s.com/information/sil2-certified-audible-and-visual-warning-signals. The web site www.e2s.com has full product information, distributor contact details and a useful reference section, with technical bulletins and white papers on various aspects of warning signalling, freely available as a resource for specifiers, system designers and consultants.